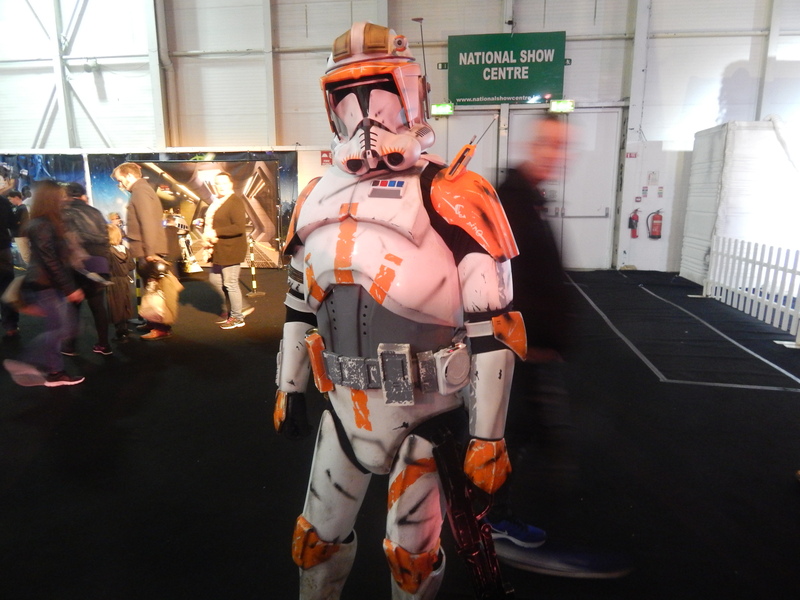 Today I attended Invasion Dublin at the National Show Centre in Swords. This is my report on the event. 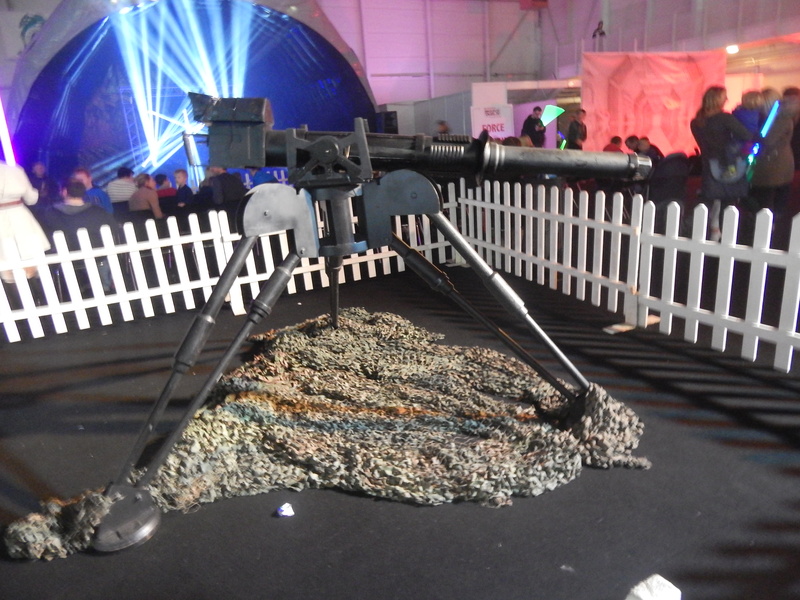 This was my fourth time at the Invasion Dublin event (and my sixth Invasion convention overall) and once through the doors it had a very different vibe than usual. Even though I’m not the biggest fan of the National Show Centre because of its location, it has a lot of space and I feel like this is why the organisers held the event there (instead of the RDS which they usually use). It certainly felt like fans had more freedom to walk around and even when the event got busy it didn’t feel overcrowded, so there was a really positive side to using the National Show Centre for the event. Invasion has given fans the opportunity to meet great guests from the films over the years and this year was no different. 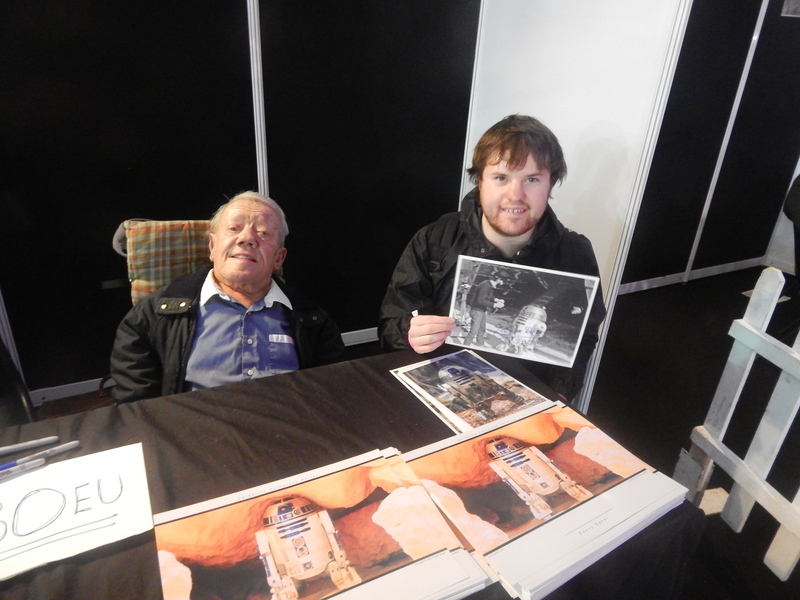 In attendance were Peter Mayhew (Chewbacca), Kenny Baker (R2-D2), Sean Crawford (Yakface) and Tim Dry (J’Quille), who all happily signed autographs for fans. I met both Mayhew and Baker (I’m pictured at the top of this article with the latter) and got autographs from both of them. I had been wanting to meet both at previous conventions but was unable to do so because of budgeting, so I knew I had to take this chance to meet both of them when there were only a few guests attending. I think €30 was a reasonable price for both of them (though the former was also charging for table pictures which I won’t pay for). Not a criticism against Invasion as it’s out of their control but it’s been troubling this year seeing this overseas trend coming into the Republic of Ireland this year (you may have heard of Troy Baker and others doing this at other Irish cons this year). Nevertheless, it was a delight to finally meet both of them and add their autographs to my collection. As always, the costumes and props from the Emerald Garrison were detailed extremely well. However, I don’t remember seeing any new costumes or props that really stood out and while I was admiring the detail on most of them, I don’t recall very many being new which was disappointing. I think the Dewback may have been new (or it made its debut at Invasion Belfast earlier in the year) but I felt like I’d seen all of their other props before, and only the costumes based on Expanded Universe characters looked new to me from the Emerald Garrison. The outstanding quality of the costumes and props is still ever-present with the Emerald Garrison though, but I would have liked to see some more new costumes and props. There was a nice selection of stalls selling Star Wars merchandise as well, but unfortunately I didn’t have any other money to spend after buying the autographs from Peter Mayhew and Kenny Baker, which was very unfortunate as one stall in particular had numerous rare figures at great prices (I was eyeing up a The Clone Wars Commander Fox for €20). I was surprised that their wasn’t more merchandise from The Force Awakens but stalls can only bring what they have… having said that, if I had more money I definitely would have bought a few figures from the stall with the rare figures. All in all, I think I’ve covered some of the great things you could see but there is something I want to highlight that concerned me going into the convention: Buying tickets for a certain number of hours at the convention. Regardless of your preference, when you buy tickets for a convention you’re usually able to stay as many hours as you want (I usually stay at conventions all day as I’m usually very busy at conventions and trying to get a lot done) so I seriously hope more conventions don’t start doing this. I was very surprised when I found this out, with both Saturday and Sunday having two sessions (morning and afternoon). The worst part was (and I can testify to this as a regular Invasion-goer) I still had to pay the same (or a similar) amount as I have done for Invasion’s in the past, but this time I would only be allowed to attend for three hours. Whether you end up leaving after one hour or six hours, you should always have the choice of how long you want to stay (I think pre-booking the Sunday afternoon slot was the best option for me going into the convention). The thing that also surprised me (though I can’t remember if this was just before Peter Mayhew’s Q&A or the quiz) but the audience was asked how many were attending Invasion for the first time and only a couple were attending for the first time of that crowd. I was really surprised that so many had still so willingly bought the three-hour tickets (I think there was a full-day ticket option but I never saw that on the Invasion website) but even if so, I really hope that tickets for a certain number of hours don’t become a regular thing at conventions. The schedule of events for the two days was the exact same for the mornings and afternoons as well. I don’t want to seem like I’m trying to be as critical as possible, so to sum up Invasion Dublin once again proved to be another great day out (especially if you had children with you), getting to meet Peter Mayhew and Kenny Baker was amazing (and both were really nice) and the costumes, props and merchandise were great. However, the three-hour tickets are a concern for me as I feel like they could become another unpopular trend at conventions. We’ll have to wait and see. *The opinions in this article are of the writer and do not represent the views of all of the Everything Geek Podcast staff*. UPDATE: A member of the Emerald Garrison has informed that the Endor Bunker at Invasion was also a new prop (I must have confused it with the 501st Ireland’s Endor Bunker as I did see it but didn’t realise it was new). The member also informed me that the day was split into two sessions (the morning and afternoon sessions I alluded to) to give members of the Emerald Garrison a sufficient break in costume- doing so made sure they could avoid having less characters strolling around the convention. Thank you to the Emerald Garrison member for the explanation.